Searching for a simple appetizer? Cubed and marinated in Asian sweet chili sauce, these delicious nibbles pair wonderfully with crackers or bread for a quick two-ingredient appetizer. 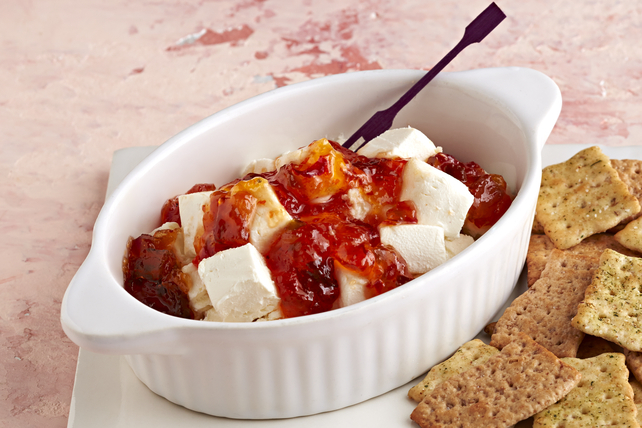 Cut cream cheese into 36 pieces; place in shallow serving bowl. Top with sauce; mix lightly. Serve with assorted crackers, crusty bread slices or pita chips. These simple appetizers can be refrigerated up to 24 hours before serving. For a change of pace, spread softened cream cheese onto bottom of pie plate; top with sauce. Serve as a spread for crackers.